Just steps from the Cathedral of St Agata and the Church of St Chiara in the heart of Unesco-listed Noto, Gagliardi Boutique Hotel is a seriously classy base for exploring southern Sicily. Think high ceilings and black marble throughout, plus a fantastic collection of contemporary art and antiques. 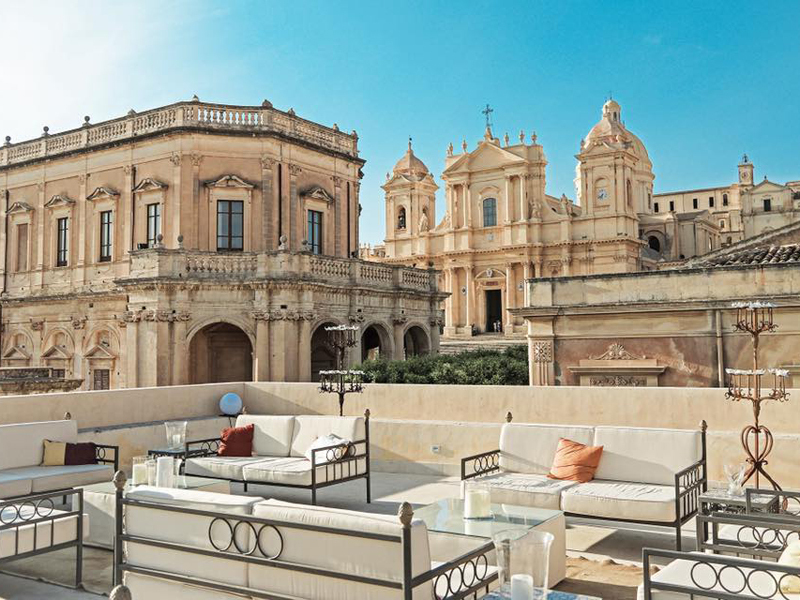 But the realshowstopper is the romantic rooftop terrace with 360-degree panoramas of Noto’s stunning Baroque architecture. Linger with a margarita as the sun slips below the honey-hued buildings. This reimagined 19th-century bakery brings modern design to Lisbon’s oldest district, with chic minimalist interiors and a mural by Vihls (Portugal’s answer to Banksy) adorning one wall. The hotel also offers free daily walking tours of Alfama and is steps away from the famous yellow Tram 28 for exploring downtown. Its crowning glory is the stunning roof terrace, with a shimmering infinity pool, wine bar serving excellent Portuguese tapas and breathtaking city views. 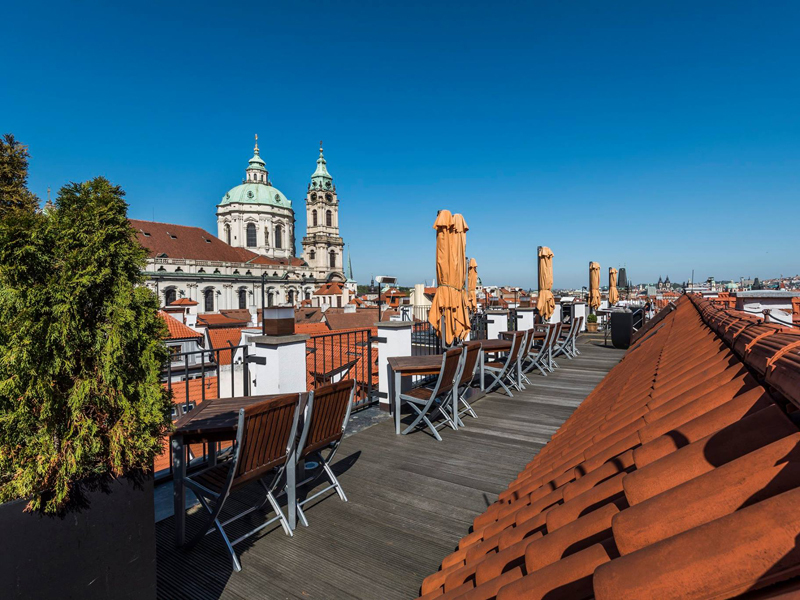 A former theatre in the Czech capital, Aria Hotel Prague is a musical haven. Each of the four floors focuses on a different genre – opera, jazz, classical and contemporary – and the 51 rooms all celebrate a different musical star, from Brahms to Joni Mitchell. 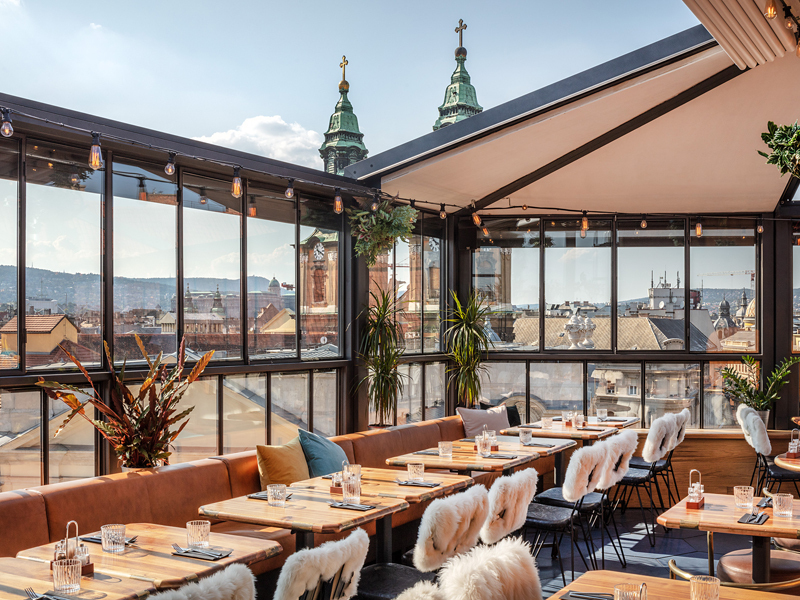 It’s not just your ears that are in for a treat though: spoiling suppers are served on the roof terrace against a magnificent city backdrop, overlooking the Baroque Vrtba Garden. Hotel Ibrahim Pasha is formed from a pair of 19th-century Ottoman townhouses in the heart of Istanbul, with all the 21st-century creature comforts you could ask for. This is a great base for exploring the city, close to the Hagia Sophia and the sights of Sultanahmet, and the generous breakfast buffet is perfect fuel before a day pounding the pavements. 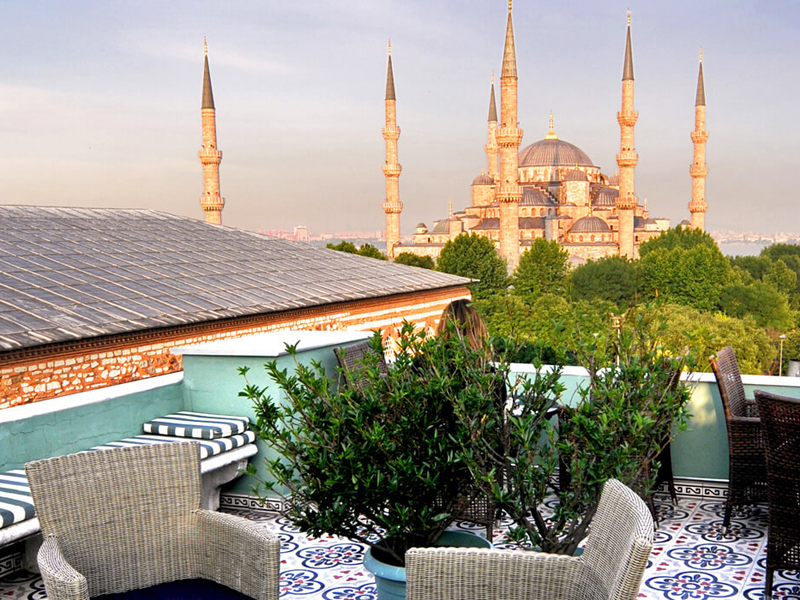 T Return to watch the sunset over the Blue Mosque and the Sea of Marmara from the tranquil roof terrace, which has a bar in summer. Bliss. A stylish and affordable choice for exploring Naples, Attico Partenopeo is located just off Via Toledo, the city’s main shopping street. You’re also minutes from the Augusteo funicular railway, which takes you up to Vamero for close-up views of the Castel Sant’Elmo. 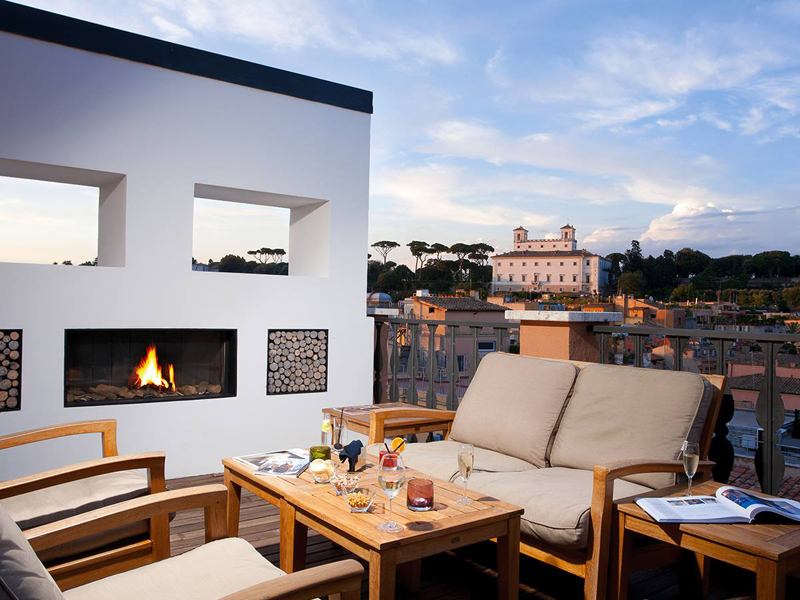 Or stay put and enjoy them from the leafy rooftop bar, where you can also gaze out at the dusty-pink dome and bronze bells of the Santa Brigida church. Budapest is a great city for a weekend break, and Hotel Rum is in the centre of the action. This former Pest apartment block turned stylish hotel has all the ingredients for a perfect city break: modern bedrooms, attentive staff and a great central location. And did we mention the buzzy rooftop restaurant and bar that serves great brunches and cocktails? i-escape guests get a complimentary bottle of Prosecco too! 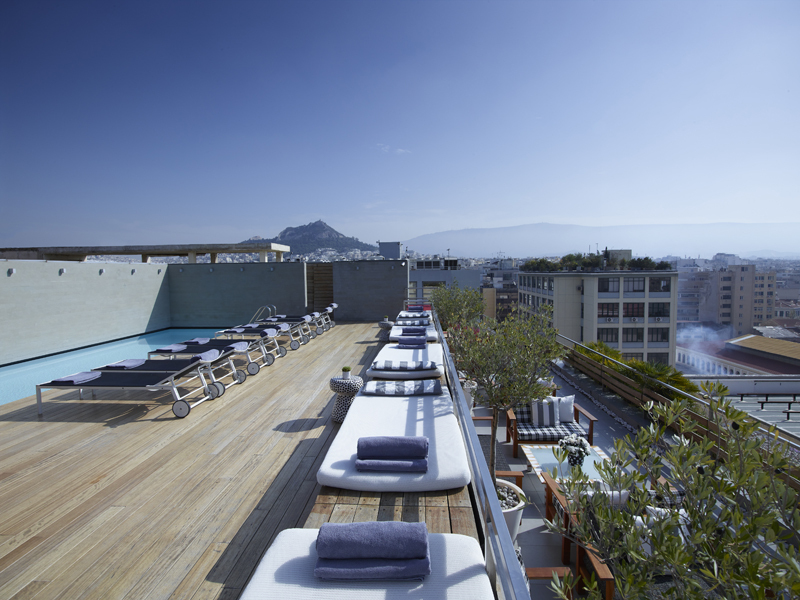 Athens’ first design hotel is a vibrant place, and one of the city’s coolest spots. Pops of fluorescent colour offset white-grey minimalist tones, quirky furniture is dotted throughout and there’s a visual and performance art gallery on the ground floor. Up top, the rooftop lounge-bar attracts a youthful crowd who come for the sparkling plunge pool, excellent food and killer views. This is city style at its finest: an Italian townhouse hotel owned by the Ferragamo fashion family. The 14 luxurious suites are exquisitely styled; rooms and communal areas are home to beautiful displays of Ferragamo designs and memorabilia. Shopaholics will be in their element as the hotel overlooks Via Condotti, one of Rome’s most exclusive shopping streets. Shop ‘til you drop before retiring to Portrait Roma’s huge roof terrace, where the charming staff will be happy to fix you a restorative cocktail. This luxurious hotel in Portugal’s Unesco-listed second city encourages serious indulgence, with a double Michelin-starred restaurant (one of only two in Portugal), Caudalie Vinothérapie Spa and a huge 25,000-bottle wine cellar. 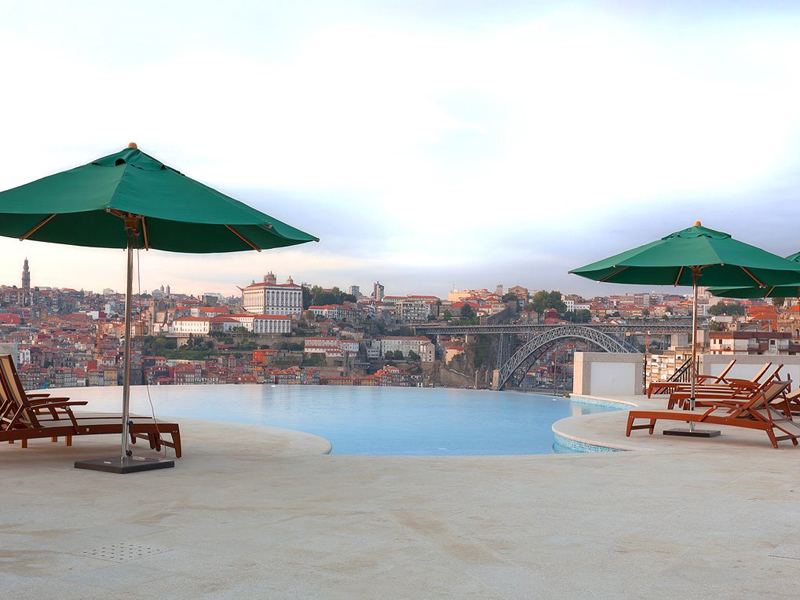 And the wine theme doesn’t end inside; the hotel is crowned by a stunning decanter shaped infinity pool overlooking Porto’s sprawling cityscape. Rooftop views don’t get much better than this. 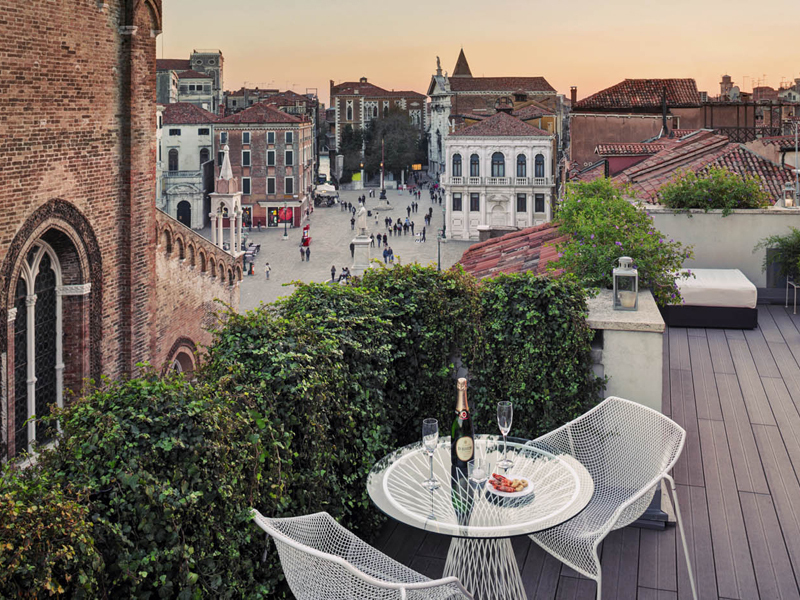 Located in Venice’s San Marco district, Bloom & Settimo Cielo are a stroll away from all the major sights, including the Grand Canal and St Mark’s Square. 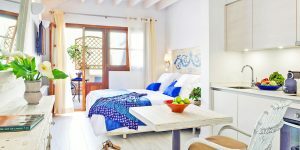 The pair of B&Bs share a restored Venetian house, with a different colour scheme in each lavish bedroom, topped with a delightful roof terrace. If you’ve spent the day battling the crowds on the ground (or the water) it’s a welcome respite – and there’s complimentary Prosecco to sip as you watch the sunset. Spread across 14 traditional houses in the heart of Seville, EME catedral hotel blends traditional Moorish design with avant-garde architecture. 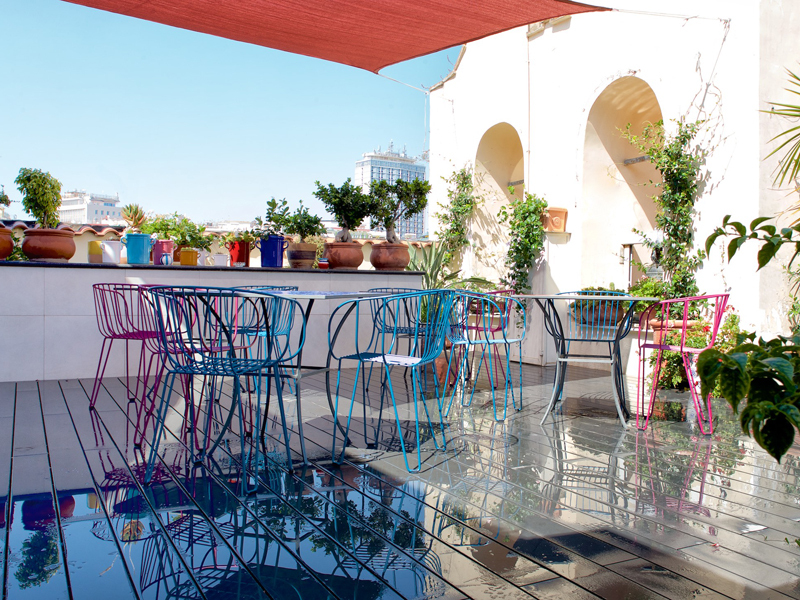 Plus, it’s foodie heaven: there are 3 restaurants to choose from, including the spectacular rooftop restaurant La Terraza: the place to see and be seen in Seville. 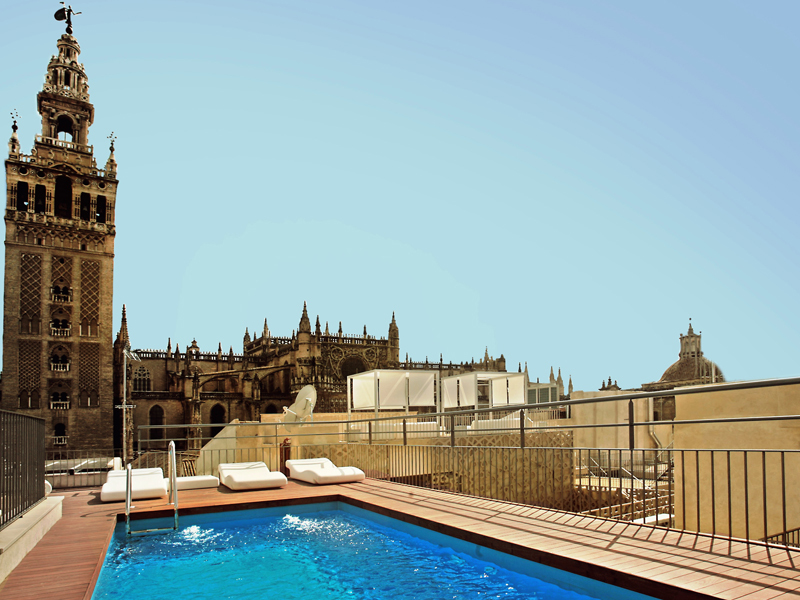 During the day, grab a perch poolside; the fabulous rooftop pool overlooks Seville Cathedral and is surely the best sightseeing spot in town.